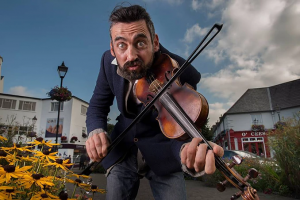 The 42nd Annual Westport Arts Festival returns for what promises to be another sensational event in the West Mayo town on Wednesday, 27th September. ?B?ut as the years rolled on, it has? beco?me an event which draws attendees from all around the country and even further afield. The f?estival? will run for five days, with bars, hotels and the ultra-modern Town Hall Theatre among the venues set to host fantastic events. After the official festival opening on Wednesday evening, there will be? an open-mic night in the Creel R?estaurant on Thursday night, where? aspiring poets, writers and musicians can? showcase their talents.? ?visit? the festival website below. An exhibition for children with an interest in Lego will take place from Friday until Sunday in the Town Hall Theatre with a competition for those capable of building their own creations. A prize-giving ceremony on Sunday evening will see plenty of awards? dished out. ‘Plein Air’ is an open-?air painting and sketching event which will run for the weekend. Everyone is invited to join the group at Christy’s Harvest Café before meeting again in the Clew Bay Hotel to share their work. As well as a poetry competition, the festival are also running a spoken word competition with the first-place prize-winner receiving a cash prize of €500. More details of this event can also be found by visiting the website. Westport Arts Festival is supported by Creative Ireland which aims to get all generations involved in arts, culture and creativity and is a Government initiative.? ?After a successful year of events commemorating the centenary of the 1916 risings, a five-year strategy was put in place to boost wellbeing in homes, schools and communities right around the country. The initiative has already supported a host of events in Mayo outside the Westport Arts Festival and it plans to continue its progress right up until 2022. One of the key aims of Creative Ireland is to ensure that every child in the country has access to education in disciplines such as art, drama, music and coding over the next number of years. The Department of Culture, Heritage and the Gaeltacht have stated that research shows that children who engage in the arts and cultural activity are happier, suffer less anxiety and do better at school and it is believed that Creative Ireland has the potential to have a positive impact on generations to come. “The festival is a fine example of the rich heritage of culture and arts we have in this county”, said Austin Vaughan, County Librarian and Co-ordinator of Creative Ireland in Mayo. For information about this year’s event in Westport, visit www.westportartsfestival.com and for further information relating to Creative Ireland and its objectives, visit creative.ireland.ie.